Creating high-quality footage of your wildest adventures is no longer a dream since GoPro cameras enable you to shoot videos in 4K resolution. Unlike professional video cameras that can capture high-resolution videos, GoPro is small and light so you won't even feel like you have a camera with you. However, if you would like to create 4K GoPro videos that have thousands of shares and millions of views you need to make sure that the footage you created is nearly perfect. All the minor imperfections like sporadic camera shakes can be easily fixed with Magix Movie Edit Pro. Let's have a look at the steps you need to take in order to create a stunning 4K video with Magix Movie Edit Pro. Until recently, Magix didn't offer support for 4K videos, which meant that the GoPro camera owners couldn't use this software to edit the videos captured by this camera. The latest version of the software enables you to edit and export 4K videos and here is how you can create 4K videos with this program. Before importing your 4K video clips into the Magix Movie Edit Pro, you first need to create a new project by clicking on 'New Project' option in the File menu. In the project settings window, you need to select the 'PAL 4K 24p 16:9' option from the 'Movie settings' drop-down menu and click OK. 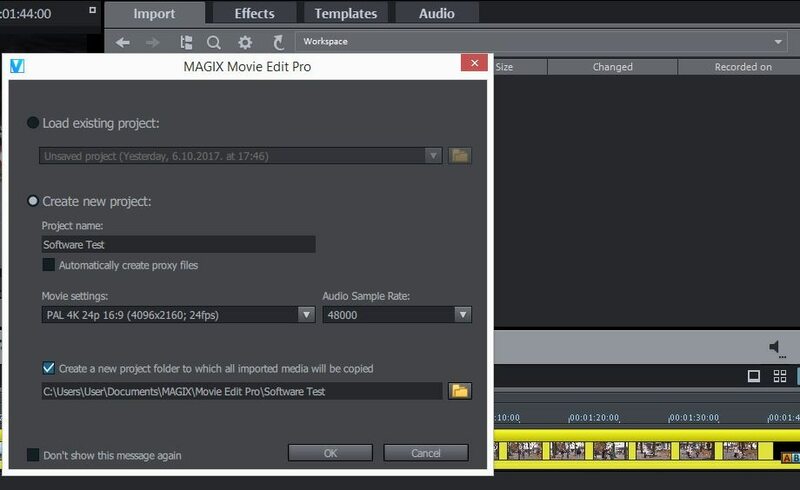 The process of importing your files into the Magix Movie Edit Pro is simple and it takes almost no effort. All you need to do, once you've placed all your 4K GoPro video files in a single folder, is to click on the 'Import' tab and navigate through your hard-disc. After you have located the folder, simply drag the file you want to import to the timeline and you are ready to start editing. Falling in love with your own footage is understandable, but it is also dangerous because you might end up creating videos that are too long and as a consequence, the online community will not be patient enough to watch the video until the end. Keep your 4K GoPro short and effective and the reception of the online community will be much warmer. GoPro videos, like much of the footage captured on cameras that aren't perfectly stable, can be shaky, and if you would like to stabilize the footage before you start applying other visual effects you can do so by selecting the 'Effects' menu and clicking on 'Image Stabilization' feature in the 'Video object effects' submenu. You can apply other visual effects by simply click on 'Effects' tab and trim or split your video clip by clicking on the icons located on the editor's toolbar. Once you've performed all the editing actions you wanted, your 4K GoPro video is ready to be exported. In order to export your videos in 4K resolution, you need to click on 'File' and find the 'Export movie' option. Once you clicked on Export movie submenu you'll be able to see all file formats in which you can export videos from Magix Movie Edit Pro. Keep in mind that only certain options like the Uncompressed movie, HEVC or MPEG-4 will enable you to save the video in the 4K resolution. Select the one that best fits your needs and proceed to adjust the export options. Make sure to click on the 'Display All' checkbox below the 'Presets' drop-down menu and then click on the drop-down menu to select the output format. Adjust all the export options in accordance with your demands and click OK button to commence rendering the video. The process of creating 4K GoPro videos with Magix Movie Edit Pro may get too technical and for that reason considering alternative video editing software like Wondershare Filmora is a great solution for GoPro owners who don't want to spend a lot of time processing their videos. Furthermore, Filmora's 'Action Cam Tool' will enable you to reduce noise in your videos by applying the Audio De-Noise filter, while its 'Video Stabilizer' feature will help you reduce the shakes in your 4K videos.